Videos : Veteran defenseman out 'indefinitely' after vicious beatdown from Tom Wilson. 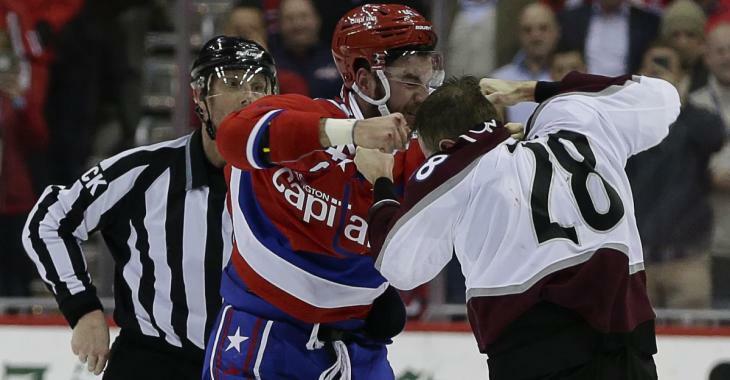 Veteran defenseman out 'indefinitely' after vicious beatdown from Tom Wilson. Brutal beating leaves defenseman in a bad way. It seems like what appears to have been a rather dirty hit on the part of one National Hockey League veteran has cost him a lot more than he would have expected. As many of our readers will know by now there was one hell of a beat down in the National Hockey League this week after Washington Capitals enforcer Tom Wilson took exception to a cheap shot delivered by Colorado Avalanche defenseman Ian Cole. The incident occurred during the Thursday night match up between the Capitals and the Avalanche and took place after Cole delivered a blatant cheap shot to Washington Capitals forward Evgeny Kuznetsov behind the play. The hit itself resulted in a 5 minute major for Cole which was certainly deserved but the real punishment would come before the officials had tallied up the penalty minutes. Just a few feet away from the hit on Kuznetsov was the aforementioned Wilson and as hockey fans will know Tom Wilson is generally not the kind of guy who's bad side you want to be on. Wilson brings a level of physicality to the game that not many others do in the modern day NHL and that is when you don't give him an excuse to do so, the hit of Kuznetsov was more than enough provocation for Wilson to go to work on Cole. The fight that ensued between the two men can only be described as a vicious and violent one sided beatdown on the part of Wilson, one that was so bad it had you feeling sorry for the guy who delivered the cheap shot just a few seconds earlier. Wilson absolutely rained down punches on the exposed head head of Cole hitting him with straight shots before eventually getting a grip on his jersey and hammering Cole in the face and head with what appeared to be devastating uppercuts. Now according to a report from Colorado Avalanche insider Adrian Dater it appears that Cole has been ruled out indefinitely following the fight, and when you consider it's February already you have to wonder what that might mean for the rest of his NHL season. Dater suspects that a concussion is the cause of Cole's current status, and given the beating you would have to imagine that is exactly the case, although he could not confirm that fact officially. If you happened to miss the fight earlier in the week don't worry we've got you covered, check out the video below.